Many investors have asked me why crypto assets have been selling off for the past two weeks. Having worked on the trading floor in investment banks for almost a decade, I was trained to rationalize market behaviours. While many have rightly singled out Bitcoin Cash fork on 15 November as the catalyst; the cascading effect has not been very well articulated. 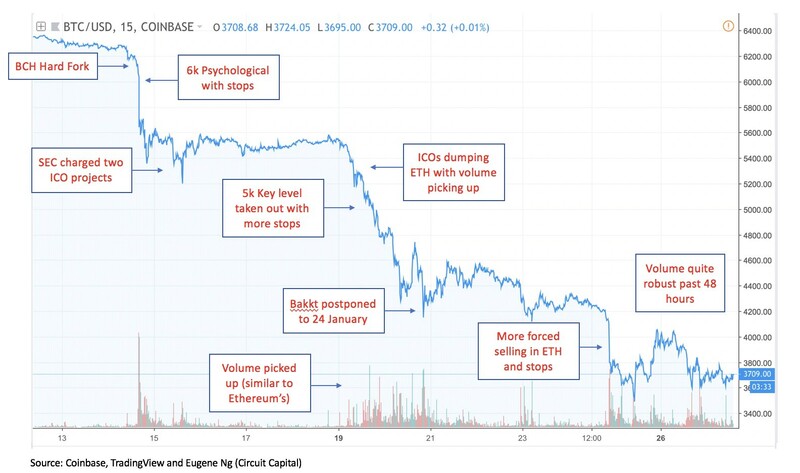 Massive declines in an asset class are typically the result of a combination of factors with the domino effect aggravating the decline, so it is not entirely accurate to conclude that $80 billion in crypto assets was wiped out because of one driving force. November 15 (Thursday): The Bitcoin Cash fork led to much uncertainty as to which emergent chain would be left. It can be argued that this chain split has been one of the most contentious, with an almost 50–50 probability just after the fork. The result? Bitcoin’s $6,000 huge psychological level broken, with more than $20 billion wiped out by the end of the day. November 16 to 18 (Friday to Sunday): The next day, the SEC announced that it has settled charges with two Initial Coin Offerings (ICO). These were the law enforcement’s “first cases imposing civil penalties solely for ICO securities offering registration violations”. Both projects have agreed to refund investors, pay penalties and register their tokens as securities. This could be the start of a broader scrutiny into ICOs, with potential repercussions being that a large number of ICOs will have to liquidate their remaining token holdings to reimburse their investors. November 19 (Monday): With the already weakening retail sentiments post SEC headlines, Ethereum started underperforming, against Bitcoin and the broader market, driven primarily by ICO projects as they panicked and offloaded more than 100,000 Ethereum. With so much downward pressure, another key level in Bitcoin, $5,000 was being taken out with stops (this time, albeit smaller than those just below the $6,000 level). November 20 (Tuesday): Despite being one of the most highly anticipated crypto events of the year, Bakkt announced that its platform will be postponed from 12 December to 24 January 2019. In collaboration with Microsoft, Starbucks and ICE, Bakkt’s platform will launch the world’s first physically settled Bitcoin futures. This will be critical for the adoption narrative in the crypto ecosystem. Unsurprisingly, on that day Bitcoin tanked to around $4,150 before picking itself back up. November 21 to 26 (Wednesday to Monday): ICO projects continue to sell Ethereum, dragging the entire market lower (i.e. Ethereum lost ~50% compared to Bitcoin’s ~44% since 15 November). Even with Bitcoin Cash ABC winning the chain split on 23 November, it brought no relief with the continued selling in Ethereum. With Tuesday’s low of $4,150 in Bitcoin failing to support the market, more stop losses were triggered through that and $4,000, squeezing short-term traders on their opportunistic longs, to mark a record 2018 low of around $3,500. Historically, all-time high volumes are seen in bottoms, while we have noticed robust volumes in the past 48 hours, we will need further pick-up and for $3,500 to be defended for further confirmation for a bottom. Having said, I’d like to think that we are not quite close to a bottom as tax-loss harvesting in the month of December will continue to add selling pressures to the market as crypto funds are forced to liquidate their investments. Also, looking at history, we have yet to feel maximum pain as the record decline in the digital asset class was 93% from peak to trough in 2011. Unfolding each day post Bitcoin Cash’s fork allows me to pinpoint the underlying market dynamics better so I that I can position my portfolio in highly volatile markets. Through this exercise, it is now clear that the current bearish sentiment is driven by a domino effect with each negative catalyst aggravating the general selling pressures — these catalysts tend to take the form of a macro event, key technical level (i.e. where most stops are close and concentrated) and broad general sentiment. It is hard to fathom a single catalyst can wipe out almost 40% of any market in a very short time frame. This is why I have came to appreciate the importance of applying market rationalization, a disciplined thinking approach that better positions and sizes my portfolio through the understanding of how market dynamics play out in volatile times like these.